In the microgravity of space, one's normal Earth haircut can fan out like the tendrils of some heretofore undiscovered species of cosmic jellyfish. When Group VIII women were still ASCANs, the astronaut office chose not to issue a policy that would dictate hairstyles for any of the astronauts. 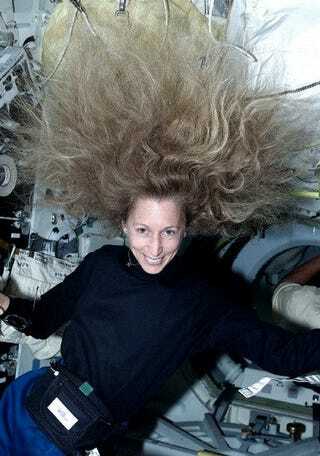 But when Marsha Ivins, known for her long hair, flew aboard STS-32 in 1990, people outside of NASA took notice of the problem. One of Ivin's crewmates snapped a photograph of a huge halo of hair floating around her head. An industrial safety engineer who saw the picture in the newspaper wrote to NASA, expressing his concern that Ivins's untethered hair created a danger of getting tangled in equipment. Despite the astronaut office's previous hesitance about dictating a policy on hair, Donald Puddy, the Flight Crew Operations Director, felt obliged to issue a memo to all astronauts that hair "long enough to present an obvious hazard" must be tied back during flight. After news of this memo made the rounds, follicular pranks soon followed. The astronauts walked out wearing bald caps and aviators in the style of noted no-hair astronaut Story Musgrave. And for the STS-54 mission, the astronauts donned fake ponytails for their walk to the astrobus.